Which Spanish exam will you take? The Live Lingua Spanish school has on staff Spanish tutors with experience in preparing students for all of the top Spanish certificates in the world. Just pick the certificate you would like to get and let our staff and tutors help you reach your goal! 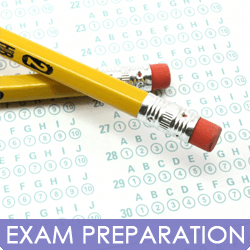 Like with all of our classes, we offer you a free trial exam preparation class before you sign up. This way you can try our service and come up with a plan of study before having to make any commitment. Make sure your computer has a working microphone. Download and install the free Skype software at Skype.com. Load Skype and create a free Skype account and username. Enroll in Live Lingua Spanish and start learning right away! Try An Spanish Lesson Try Us Out! Take a 60 minute trial Skype lessons with one of our Skype Spanish teachers. No credit card required. Our Spanish teachers have university degrees and years of Spanish teaching experience. "This has been a real eye opener for me. I had never learned another language before, and I am loving it. The most interesting part for me is that I am also learning so much about the Mexican culture in addition to the language. If anybody is on the fence about trying Live Lingua, I would say go for it. They let you try for free, so you have nothing to loose."